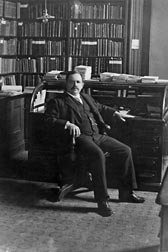 Calories in foods are often determined by a system developed at the turn of the 20th century by ARS chemist Wilbur O. Atwater, shown here. Mom was right. It’s important to chew your food fully. Chewing begins the digestive process of liberating nutrients from their food matrix, and this release is necessary before nutrients are considered “bioaccessible.” In addition, the physical form of a food affects its energy and nutrient availability, which is called “bioavailability.” Nutrients must be released from a food—becoming bioaccessible—before they are bioavailable to a consumer. But hard foods, like nuts, for example, may not be fully chewed before they are swallowed. Within the last decade, several published studies have shown that when certain nuts are included in the diet, the amount of fat excreted in stools increases. In theory, this fat was not absorbed because digesting the nuts’ cell walls was difficult, and that reduced the bioaccessibility of the fat within the nut. Researchers at the Agricultural Research Service’s Beltsville [Maryland] Human Nutrition Research Center (BHNRC) studied the caloric accessibility and availability of two different tree nuts, pistachios and almonds. They recognized that reduced fat accessibility could affect the available calories provided by a given food matrix. The goal was to study available energy from foods that require significant mechanical and enzymatic action to permit estimates of bioaccessible energy. To achieve that goal, the ARS researchers further developed the commonly used method for estimating the number of calories in the nuts studied. 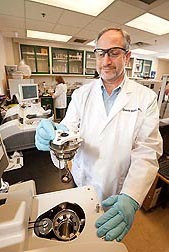 Close-up of ARS chemist Wilbur O. Atwater. 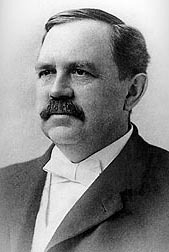 Most often, calories in foods are determined by a system developed by Wilbur O. Atwater at the turn of the 20th century. Atwater was a USDA-ARS chemist at Beltsville and is known as the founder of nutrition as a science in the United States. The system he devised assigns a calorie value to each gram of protein, fat, and carbohydrate found in foods. Protein and carbohydrates are estimated, on average, to provide 4 calories per gram, and fat is estimated to provide 9 calories per gram. These calorie values are known as the “Atwater Factors.” Atwater derived these values by feeding a mixed diet, meaning several foods at once, to a small group of volunteers. Recently, BHNRC physiologists David Baer and Janet Novotny expanded on the Atwater methods and arrived at a lower estimate than previously reported for the available calories from the two tree nuts they studied. Their modified method is more accurate for estimating the amount of calories in hard foods. It should work well for other foods, too, the scientists say. Baer and Novotny first conducted a feeding study in humans to measure the caloric value of pistachios. In the USDA-ARS National Nutrient Database for Standard Reference, whole pistachio nuts are reported as having 160 calories per 1-ounce serving. The researchers reasoned that if the fat from the nuts is generally less accessible (due to difficulty in digesting the nut’s cell wall) than fat from other foods, then nuts may not provide as many calories as previously thought. ARS physiologist David Baer inserts a study-diet sample into a bomb calorimeter for analysis as biologist Theresa Henderson prepares the next diet sample pellets for testing. The team fed 16 healthy adults pistachios at 3 different levels: none, 1.5 ounces per day, and 3 ounces per day, along with a background, or “base,” nut-free diet. Each of the pistachio levels was fed for an 18-day-period. Urine and stool samples were collected and analyzed from all feeding periods. For the study, Novotny, a mathematician and expert in digestive physiology, wrote a series of algebraic equations. These equations were used to evaluate data gathered from the biological samples, after they had been analyzed using traditional equipment called a “bomb calorimeter.” The bomb calorimeter was used to measure calories in the foods that were fed to volunteers (energy in) and also to measure the same foods’ excreted remains (energy out). This analysis enabled the team to measure the calories specifically supplied by the target food—pistachios—even though the nuts were consumed along with the base diet. “A novel feature of our expanded method is the paired-diet approach, where the base diet always consisted of the same foods and composition, thus allowing us to tease out the caloric value of the single target food,” says Novotny. The researchers then compared the metabolizable energy of the nuts fed during each treatment period to the energy estimated by the Atwater Factors. The study suggests that the caloric value of pistachios has likely been overestimated by about 5 percent, because the fat from the nut wasn’t completely absorbed by the intestinal tract. The study, which was published in the British Journal of Nutrition in 2011, was supported by USDA and Los Angeles-based Paramount Farms, Inc.
Study volunteers consumed nuts as part of a controlled diet to determine the true energy value of the nuts. ARS physiologist Janet Novotny (left) provides 42 grams of pistachios to study participant Susan Conroy as dietetic technician Kenneth Mroz checks the study food on her tray. Baer and Novotny conducted a similar human clinical trial in which they fed the volunteers three different levels of whole almonds as part of a carefully controlled diet for an 18-day period. According to food labels, almonds provide 168 calories per 1-ounce serving, but the researchers found that the same serving actually provided 129 calories when computed by the modified method. This difference was due in large part to loss of undigested fat, protein, and carbohydrate in the stools, according to the authors. The study showed that it is possible that the total number of available calories from certain whole nuts, and perhaps other similar foods, may be lower than originally estimated using the traditional specific Atwater Factors. The study, which was published in the American Journal of Clinical Nutrition in 2012, was supported by USDA and Almond Board of California. “These studies point to a reason that a single caloric-value number, or energy density, based on assumed digestibility for all three macronutrients, particularly fats due to their higher number of calories per gram, is not totally appropriate for all foods,” says BHNRC director John Milner.—By Rosalie Marion Bliss, Agricultural Research Service Information Staff. David Baer and Janet Novotny are with the USDA-ARS Food Components and Health Laboratory, 10300 Baltimore Ave., Beltsville, MD 20705-2350; (301) 504-8719 [Baer], (301) 504-8263 [Novotny]. "An Improved Method To Estimate Calories" was published in the September 2013 issue of Agricultural Research magazine.